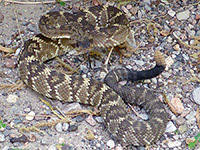 Some of the best hikes in Arizona are along riparian desert canyons, where permanent streams flow through rocky gorges, flanked by trees, bushes and wildflowers, with arid, cactus-covered slopes rising high above, and one of the most famous locations is Aravaipa Canyon, 50 miles north of Tucson at the foot of the Galiuro Mountains. The drainage is about 60 miles long and most is unremarkable, forming a broad valley east of the mountains, but for 15 miles on the north side of the range the stream is enclosed by sheer or very steep cliffs up to 600 feet high, and in some places the water covers all of the canyon floor. Nine major tributary canyons are also deep and narrow for some distance, and several days could be spent exploring the whole system. 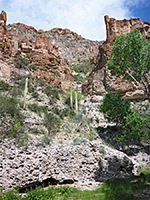 The scenery is typical of many similar ravines in Arizona, including stepped, buff-colored cliffs and benches, clear water flowing over a succession of pools and rapids, and sand or pebble beaches alternating with dense patches of vegetation. 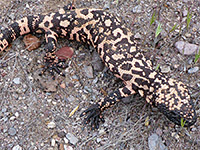 Many plant species grow in the varied habitats of aquatic, riparian, woodland and desert, including numerous saguaro in the dryer environment of the upper canyon walls. Several factors explain why Aravaipa is an especially popular destination. Access, although along winding, partly unpaved roads, is still relatively straightforward, and the ten mile hike all the way through the gorge has a BLM-maintained trailhead at either end. The canyon system is large enough to allow multi-day trips, and there are plenty of sheltered, level locations for camping, a safe distance from the creek. 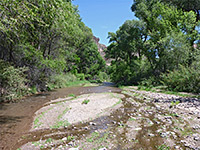 Aravaipa has no obstructions such as swimming pools or dryfalls that are often found in desert canyons, so the place can be explored quite easily - trails run beside the creek for most of the way, and the deepest water to be waded is usually just a few inches, though flash floods do sometimes occur. Also, the canyon is quite unspoilt, with no development in the deepest ten mile section, though houses and farmland are found in the wider parts up and down stream. 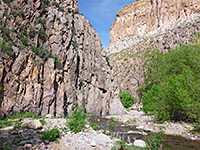 The enclosed section of the canyon is part of the 19,410 acre Aravaipa Canyon Wilderness, which extends across the surrounding peaks and plateaus, and includes the various tributary ravines. A permit system is operated by the BLM to limit visitor numbers, preserve solitude and hence protect the canyons; a maximum of 50 people are allowed to enter per day; 30 from the busier west trailhead, and 20 from the less accessible east entrance. Popular times, like weekends in the spring and fall, may require reservations several months in advance (permits become available 13 weeks ahead). The maximum stay is three days, and the maximum group size is ten. Pets are not allowed. Land at either side of the wilderness is also protected, part of the Aravaipa Canyon Preserve, which is managed by the Nature Conservancy. 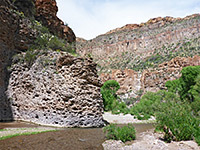 The majority of visitors enter Aravaipa Canyon from the west, since the access road is shorter and fine for regular vehicles, though not large RVs. Aravaipa Road forks eastwards off Highway 77 between Mammoth and Dudleyville, initially crossing empty, public land that offers some free camping places, and becoming unpaved as it enters the mouth of the canyon, continuing through mostly private land for the next 8 miles, a mix of homes and ranches. The road becomes more winding and narrow 4 miles from the end, and climbs up and down a few steep sections, since it crosses the hills a little way up the north side of the valley rather than following the flat canyon floor. A ranger station is passed 3 miles from the end, and after here the route is somewhat rougher. Trailhead parking is on a flat bench 120 feet above the canyon floor, beyond which the road is closed by a gate; it continues a short distance to the furthest ranch in the canyon, just before the boundary of the wilderness area. 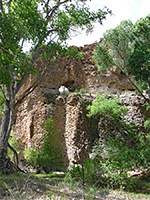 The east entrance to Aravaipa Canyon is 10 miles beyond the semi ghost town of Klondike, along an unpaved, sometimes rough track that fords Aravaipa Creek several times, so a high clearance vehicle is required. 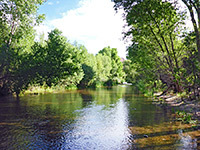 The last 2 miles crosses land prone to flooding, hence visitors are advised to park before, on the north side of the creek at the junction with Bear Canyon. The furthest parking area is at the junction with Turkey Creek, right at the edge of the wilderness area, where the track turns south, heading up this side canyon. Klondike is 32 miles west of US 70 and 30 miles northwest of Bonita (at the end of Hwy 260); both routes are unpaved but wide and well maintained.